One of the largest videogame piracy raids in history has taken millions of dollars of illegal goods off the streets. Videogame piracy is a massive issue in Asia, but the black market in Taiwan recently took a huge hit. Late last month, Taiwanese police raided a warehouse filled with thousands of pirated videogames worth millions of dollars in one of the region's biggest busts ever. 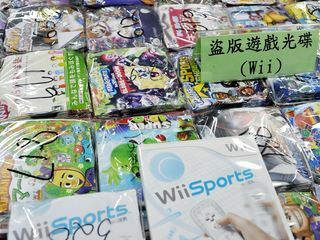 Officers working with Taiwan's Intellectual Property Rights Police Team found 140,000 copies of PlayStation 2, Wii, and Xbox games in the raid. The pirated goods were worth approximately $8.4 million on the street, which is reportedly the largest blow to videogame piracy in Taiwan's history. The raid was the result of a 7 month investigation that began thanks to tips from game developers. Of the raid, an IPRPT spokesman said: "Nearly all of the pirated disc inventory in Taiwan was busted in that operation. There must be a shortage on the market now." It's not confirmed whether or not this was wishful thinking on his part, but $8 million worth of pirated games is certainly a lot. Four suspects were also arrested as part of the raid, whom had been traveling between Taiwanese capital city Taipei and Chinese mainland city Guangzhou where the pirates' factory was located. Part of the ring's attempt to conceal its operations included some members pretending to be customers on a website. When the suspects would receive goods, these fake orders made things look more legitimate. Ultimately, the IPRPT says that the factories in China are the real problem, and piracy won't stop until they can be taken out. Considering how big piracy is in China, I don't think that's going to happen anytime soon.